The end of February is upon us, and J. and I have officially made it through our first full year of pollinator gardening. 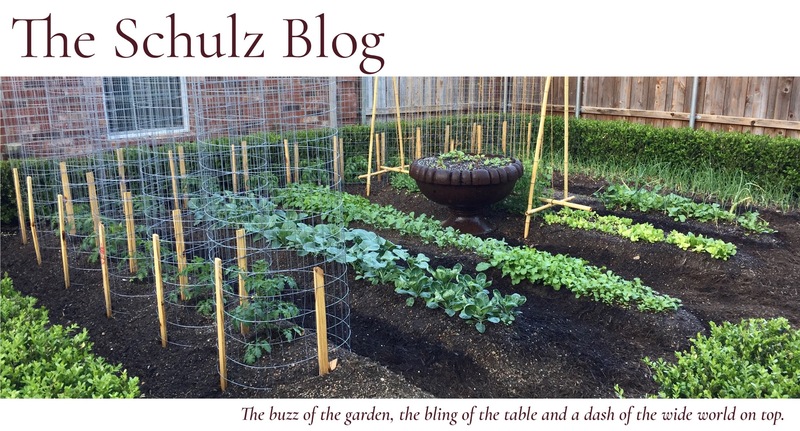 Having lived and breathed the garden’s dynamic kaleidoscope of color and movement, I can honestly say that the emergence of buds cannot come fast enough at the Schulz house. For many of us, gazing out the window at winter landscapes dotted with scraggly drab twigs and crumpled up leaves can seem a bit overwhelmingly depressing. It’s not surprising, then, that the urge often exists to “cut it all back” and get rid of the brown. I get it. I truly do. But for pollinator gardeners like us, the lanky brown-ness must subsist, for beneath all of that misshapen debris lies a dormitory of snoozing insects just waiting for the alarm clock of spring to buzz (no pun intended). Dead vegetation is also a corner store for winter birds, providing left-over seed pods for consumption and material for nest construction. This is one example in life where garden function must supersede form. So what do we do with all of this brown? I say interject some green. We’ve had some pretty cold temps in North Texas this winter, so cold that even our Frostweed iced, so I was surprised to see some of our plant varieties in the pollinator garden actually maintaining their green. If you are beginning to think about planting for the spring, I would highly suggest incorporating the following selections into your design, as they will continue “going green” throughout the winter and, thus, inject a little life into your deceased landscape, so to speak. They also might be the one saving grace that keeps those hand pruners and shears tucked neatly away, as they should be, for the winter. So, try a few of these specimens out and see what you think. I snapped all of the primary photos of the plant while temps were still in the 30’s outside. These are a few of MY favorite greens! This was truly our winter showstopper! We had temps down close to 10° F, and our parsley just kept on trucking. I can’t attest to flat-leaf varieties and their ability to sustain the cold, my guess would be that many wouldn’t be as hardy, but the curley-leaf was a winner. Throughout this blog I will try to give the specific scientific name on anything, so that if you look to make a purchase you will know exactly what you are buying, BUT that will also require committed organization on my part, which means not discarding the original packaging. Sadly, I can’t provide the exact Genus and Species for this variety, BUT I will be hosting a plant share this spring to promote #plantsharenow and will have a few potted starts to share. In addition to its continuous greening abilities, parsley is an excellent host plant for the Eastern Black Swallowtail. I should mention, however, that if you happen to plant fennel next to your parsley, the Swallowtail will eye your fennel as a slice of chocolate cake and your parsley as an apple. We’re all fine with eating apples, but, given the choice, most of us will choose the cake. Planted side by side, our fennel WAY out-performed the parsley in Swallowtail attraction. Female Eastern Black Swallowtail release, post-hatch. We bought this species (Lavandula stoechas ‘Otto Quast’) as a plant start from a local nursery. The purpose in our purchase was for its blossoming fragrance and ability to attract bees, butterflies and even hummingbirds, and we really didn’t even think about its evergreening capabilities. I like this addition because it easily grows from 1 to 3 feet tall, creating some nice wintry green height to any bed. We have two clumps flanking each end of our pollinator garden for balance. With the other nectar choices that we had in our garden, again chocolate cake versus an apple, I found that butterflies and hummingbirds landed elsewhere, but the bees absolutely loved this plant. A third favorite, and kind-of a bonus surprise, was this variety of Primrose. Apologies here for sure. I have no idea about the specific scientific name. This came in a wildflower mix packet in one of those, “Let’s see what happens if we just scatter this,” moments. I will have some starts of this available at the #plantsharenow event this spring as well. Primrose is a clumping plant that easily spreads in colonies, so to speak, so it can make for an excellent ground cover. Some of the leaves will turn a lovely crimson in fall and winter, speckled among the green, so it also provides additional color interest. You can see in the photo above that a few of our clumps seem to exhibit the possible beginnings of Botrytis Blight, by the brown spots appearing on the leaves. This wouldn’t be surprising, considering all of the moisture we have had lately, coupled with the lack of air flow that often happens in clumping plants. We’ll have to get on this soon so that it doesn’t spread! I cannot compliment this Dwarf Mondo Grass enough! We purchased this variety in flats from a local nursery. Unfortunately I did not keep a tag, but I will also have volunteers for the taking, that have begun spreading into unwanted territory, at #plantsharenow. We planted our pollinator garden on a pretty steep slope, so we used this mondo grass as a bottom border between the bed and the concrete sidewalk to help deter runoff and soil erosion. We planted the initial plants (across a 40+ foot span) about 6 inches apart, from center to center, and a year later the entire border is completely full, with no visible space between plants. This border remained green and full throughout the entire winter season, which helped consistently define our garden as “a garden” to passers-by on walks with children and dogs. Do you have a favorite winter green? Tell us about it below! My favorite “winter greens” are flat leaf Italian parsley and Swiss Chard. I have had great success with both in my North Texas gardens. I’d vote for rosemary today but it might be something else tomorrow! Always a favorite! No garden is complete without a little rosemary.